What are Pasticiotti and where do they come from? Well this delicious Italian Cream Filled Pastry is made with Italian pastry dough or Pasta Frolla. 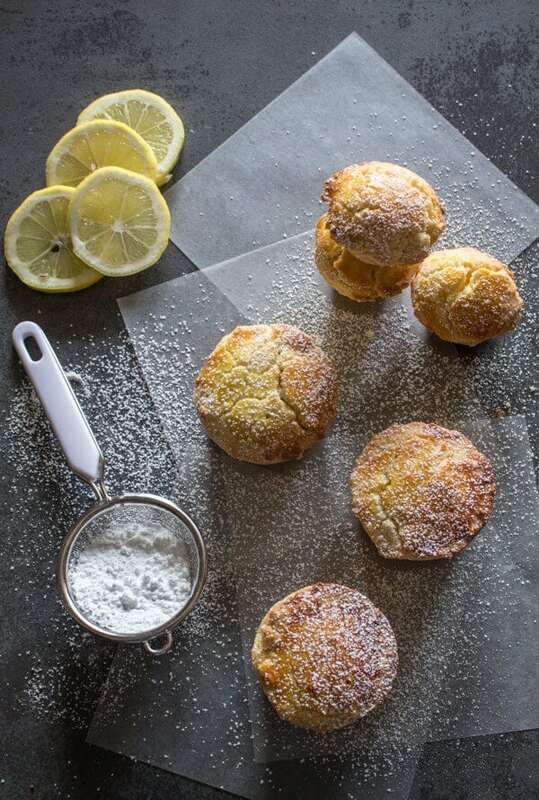 It is lined in individual tart forms filled with usually a pastry cream or sometimes a ricotta filling. It is then covered with another layer of pastry dough and baked. It was apparently invented by a Chef from the Province of Lecce in the Southern Region of Puglia. 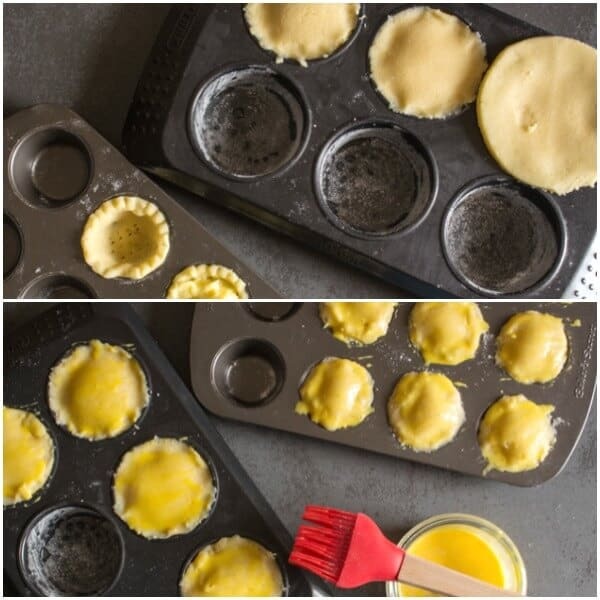 He created these “mini cakes” from his leftover scraps and named them Pasticiotti meaning pasticcio or mishap. Needless to say they were and are a big hit, and believe me they are delicious. I decided to fill them with a Lemon Pastry cream this time, but you could also use a Simple Pastry Cream. The rind of the lemon is heated along with the milk and cream, left to sit for 10 minutes and then strained into the egg mixture. The Lemon taste is quite delicate, so if you prefer a stronger lemon taste I would use the peel of two lemons instead of one. Remember to be very careful when peeling the Lemon, you don’t want the white part, which will give the Pastry Cream a Sour taste. I prefer to make my Pastry Cream first because it needs more time to cool down then the Pastry dough. I also made them with my muffin tin because there is no need to go out and buy new pastry forms. And they work perfectly well. You could probably get 6 medium and 6 small muffin Pasticiotti out of this recipe. Although I made a large one instead of 2 medium. It was pretty well eaten as soon as it came out of the oven. Pasticiotti Italian Cream Filled Pastry are usually served for breakfast but are also eaten throughout the day. Sounds good to me! 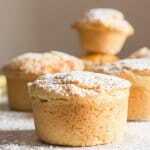 So however you decide to fill these yummy tarts, be sure to eat them warm with a little dusting of icing sugar. Let me know what you think. Enjoy! Pasticiotti Italian Cream Filled Pastry, a delicious baked breakfast or dessert recipe. 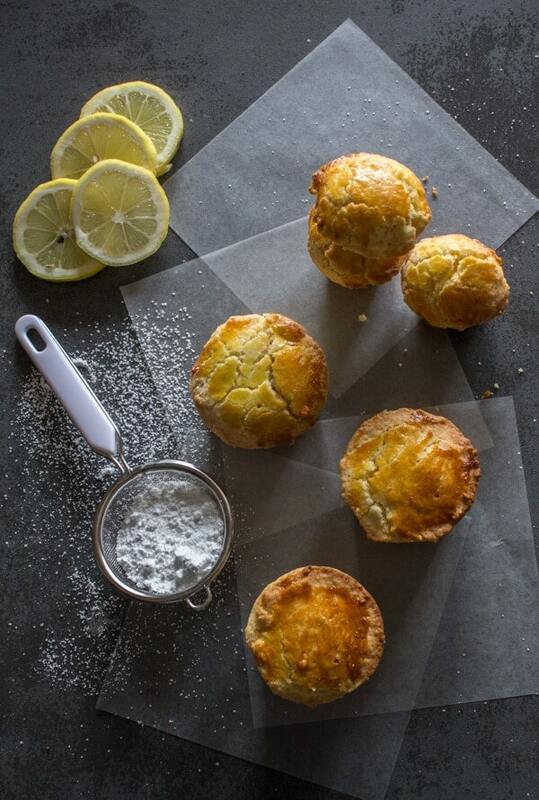 Pastry dough filled with a creamy lemon filling. In a large bowl whisk together salt, flour (start with 2 cups add a little more at a time up to 1/4 if needed), sugar and baking powder, make a well in the centre and add egg, egg yolk and butter (cubed), mix together (you can also use a food processor, pulse until dough just starts to come together), remove dough to a lightly floured flat surface and knead until it becomes a soft dough, wrap in plastic and refrigerate for 30 minutes. 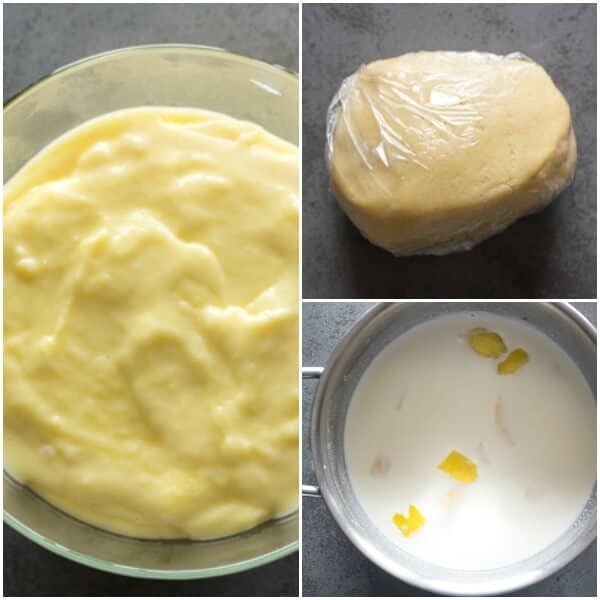 In a medium pot, heat over low the milk, cream and lemon rind, until very hot but do not boil. Remove from heat and let cool to warm. In a medium pot add yolks and sugar, whisk together until combined, then add flour and vanilla, place pot over low heat, pour the warm milk/cream through a sieve to remove the lemon rind (disgard), whisk continuously until thickened. 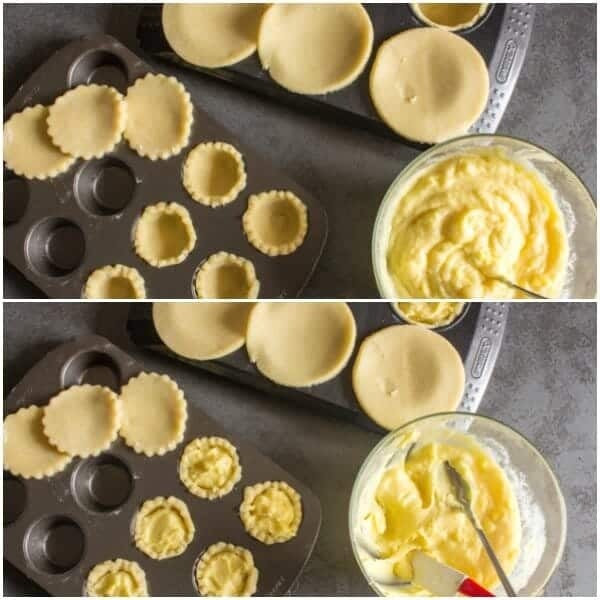 Remove to a glass bowl, cover with plastic wrap (make sure wrap touches the cream mixture and refrigerate approximately 1 hour or until thickened. Pre-heat oven to 350° (180° celsius) Grease and flour 6-9 medium and 6 small muffin tins. Remove dough from fridge, on a lightly floured surface knead a few times to soften it up. Roll to 1/8" thickness, cut out circles and fit to muffin pan. 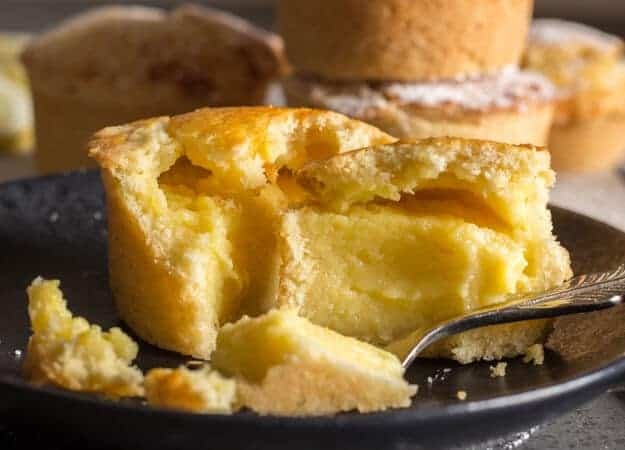 Prick the bottom of the tart with the end of a fork and then fill almost to the top with Pastry Cream, top with another cut out circle, cut with a knife to remove excess dough and seal with fingers. (seals better with fingers lightly dipped in water). 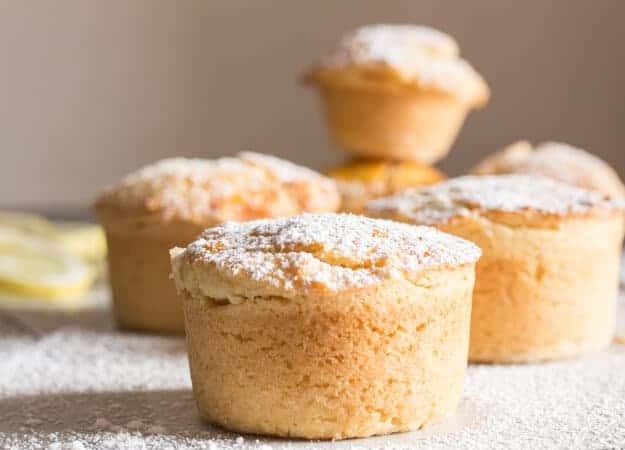 When complete, in a small bowl mix together 1 egg and 3 teaspoons cream, brush the top of each muffin tart and bake for approximately 30-40 minutes. Let cool to warm. Dust with icing/powdered sugar. Enjoy! Me and my family enjoyed pasticiotti while on vacation in Lecce last year. This recipe is on point ! I can’t wait to see my kids faces when they get home today 😁 thank you. Hi Barbara, thanks so much and I hope they enjoy them. Have a great weekend. These are so delicious. My husband and I don’t like anything too sweet. With the pastry I only put two tablespoons of sugar and only quarter of a cup of sugar in the custard. They were still sweet enough. This will definately be a recipe I keep for special occasions. I am going to try making a coffee custard next time. Hi Petra, thanks so much, so glad you enjoyed them. And less sugar is always good. Have a great weekend. These sound wonderful. Could these be frozen or would they get soggy? Hi Linda, thanks, no not a good idea to freeze them unfortunately, because they will go soggy. I’m not getting an option to follow this page on Pinterest. If I sign up, will that give me access to all of the same recipes and this page above? I don’t know anyone outside of my family who makes Pasta Frola! My Italian family in Argentina make that. You know how to cook, I don’t follow many people, maybe I’m missing the how to save this page but definitely want to follow you. Huge compliment. Can’t wait to try your recipes! I’m using my cell, does that make a difference in following web links?? Hi Cheryl thanks so much. In order to follow me on Pinterest you need to have a Pinterest Account is that what you mean? You can also sign up for notifications and or the newsletter (the notification signup pops up on the top of the page and the newsletter signup is on the right side bar). Your cell phone shouldn’t make a difference. Hope that works for you. In Rome N.Y.we had a pasta chock,I am unsure of its spelling do you have a firm dough with pudding inside.recipe? Hi Jill, haha that name is great, it is so close I think you mean Pasticiotti and yes I do here is the link https://anitalianinmykitchen.com/italian-cream-filled-pastry/ . Have a great weekend. Hello, Love the recipes that you’ve supplied…. Thank you! I’m just wondering about another recipe and wondering if you knew what it is called? I think it is either Cavaganite? or Casaganite? It is a small ravioli filled with a combation of chocolate, coffee, chickpeas, etc. I’d love to know how to make it. Christine, if you aren’t eating them within an hour or so I would say yes because of the cream. I was wondering if this could all be prepped the day before, then assembled the next morning? Hi Sandra, sure, you could make the pastry and the cream (wrap the pastry in plastic and cover the bowl with the pastry cream with plastic) and leave it in the fridge overnight. I would remove the dough about 30 minitues from the fridge before rolling out. Hope that helps. Something wrong with the dough. I followed it to a “t” and it is too crumbly, I think there is something missing in your instructions. Hi Natasha, this is the dough I have always used and the ingredients are right, you just have to give it time and work it to bring it together, if you must add a little softened butter to bring it together. (or use a food processor to help) hope that helps. For breakfast? Bring. It. On. Italian pastry for breakfast sounds divine. Hi Allie, haha I totally agree.